On 30 November 2017, UNRCCA hosted the 6th Mini-Dublin Group (informal co-ordination group of like-minded countries on the fight against illicit drugs) meeting in Ashgabat chaired by the Ambassador of Italy to Turkmenistan. BEIJING – On 20-21 November, Ms. Participants of Seventh Regional Economic Cooperation Conference on Afghanistan (RECCA VII) in Ashgabat, Turkmenistan 15 November 2017. UNRCCA participated at the Seventh Regional Economic Cooperation Conference on Afghanistan (RECCA VII). On 14-15 November 2017, UNRCCA took part in the Seventh Regional Economic Cooperation Conference on Afghanistan (RECCA VII) that was held in Ashgabat. 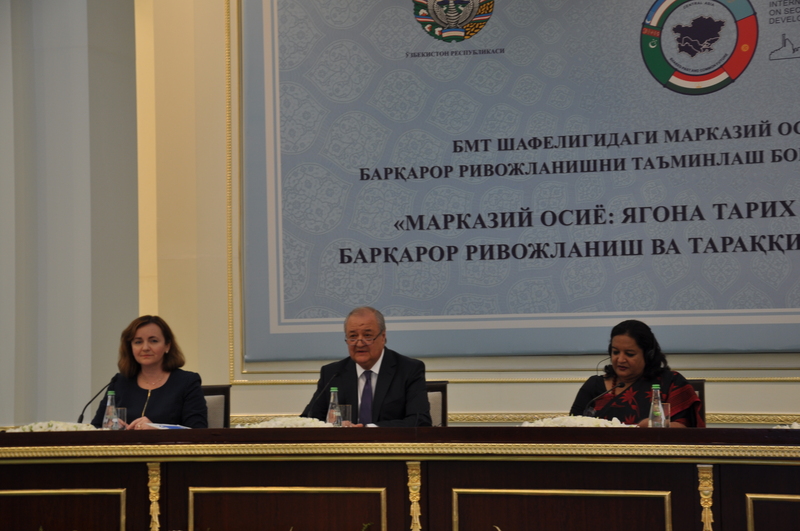 SRSG Ms. Natalia Gherman and ASG Mr. Miroslav Jenca at a meeting with President of the Republic of Uzbekistan, Mr. Shavkat Mirziyoyev. Tashkent, November 11, 2017: The Special Representative of the UN Secretary-General, Head of the UN Regional Center for Preventive Diplomacy for Central Asia (UNRCCA), Ms. Natalia Gherman, paid an official visit to the Republic of Uzbekistan on 9-11 November. Ashgabat, October 26, 2017: UNRCCA has attended the two days meeting in the frame of “Heart Of Asia – Istanbul Track 2”, which took place in Istanbul, Turkey, on 24 – 25 October 2017. On 19-20 October, Special Representative of the UN Secretary General and Head of the UN Regional Centre for Preventive Diplomacy for Central Asia (UNRCCA) Natalia Gherman paid an official visit to Tajikistan. Ashgabat, October 18, 2017: UNRCCA attended the 6th round of the Herat Security Dialogue, hosted by the Afghan Institute for Strategic Studies (AISS), which took place in Herat, Afghanistan, on 13-14 October 2017. Millions of lives have been shattered this year by drought, storms, earthquakes, landslides and heatwaves. Last weekend, I witnessed firsthand the dramatic levels of devastation caused by severe hurricanes in the Caribbean. ASG Jenca and SRSG Gherman, Ashgabat, Turkmenistan. The Secretary-General met with H.E. Mr. Kairat Abdrakhmanov, Minister of Foreign Affairs of the Republic of Kazakhstan. The Secretary-General and the Foreign Minister exchanged views on Kazakhstan’s priorities during its upcoming presidency of the Security Council.